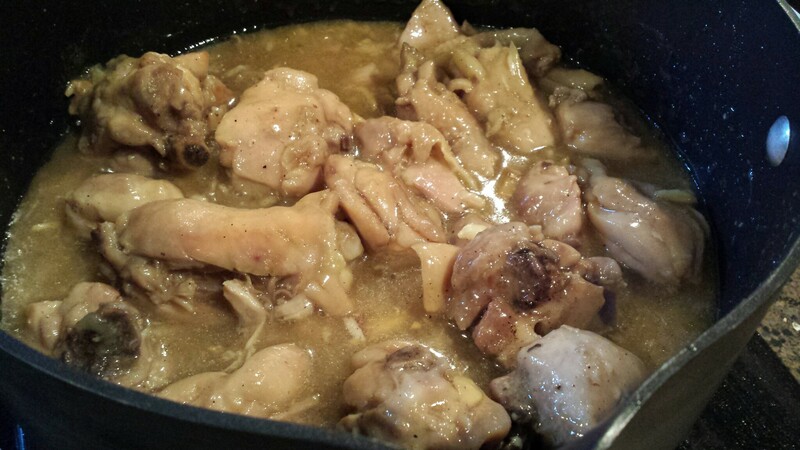 Slow-cooked chicken with ginger, garlic, and onions. I love this recipe. It’s one of those classic home-cooking recipes that you aren’t likely to see at a restaurant, but every family makes it. In fact, when I was in Vietnam several years ago I made some friends and visited their village for one night. They showed me how to grow rice in their paddy, and we walked around the village, and practiced driving a motor scooter while trying to avoid the water buffalo that hung out on the roads. At night their mom made us a big feast for dinner, consisting of rice from said paddy, rau muong xao toi, and this braised chicken (freshly killed from their neighbor). Very traditional, very delicious. I also ask my mom for it every time I make it, so I thought I’d blog it so I could stop bugging her. I’ll tell you how I do it and also make notes for where my mom takes more time and makes it more delicious than I do. Also, it’s made with items that you probably have in your pantry (we buy garlic from Costco and always have onions and ginger and frozen chicken parts). This is a RAW file. I’m just kidding it’s a jpeg. If you don’t have fish sauce in your pantry and you’re interested in making Vietnamese food ever, then you should buy a bottle. If you aren’t, then I’m not sure why you’re reading this post. I like using coconut water/juice (I always keep it around because it’s all I drink when I’m sick), but water or chicken broth work great too. My mom always soaks chicken in salted water for half an hour before cooking it, “to get rid of the smell.” Brining does keep the chicken super moist, but I’m always too lazy to do it. It’s good if you feel like it though! 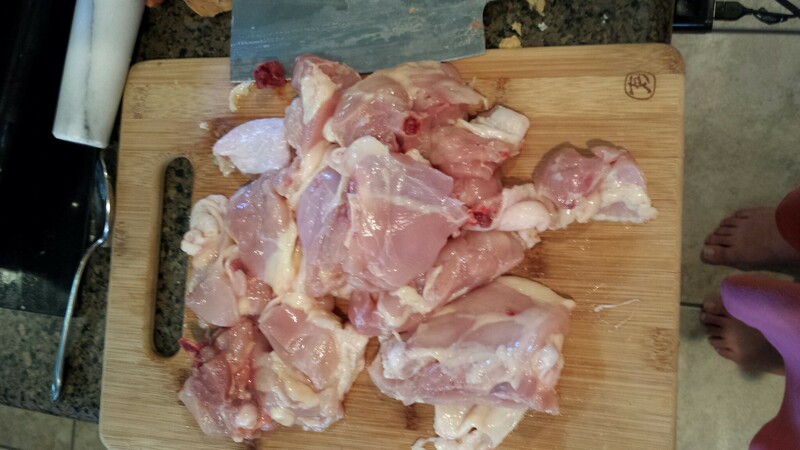 Also, traditionally the chicken parts are chopped up into bite-size pieces for this dish. Part of that is frugality and part of it is flavor- more surface area to soak in more of the sauce. Plus it’s fun to bust out your cleaver! I generally make the pieces baby-fist sized (so three or four bites) because I am lazy. You could also not chop them. I guess they had to give that suburban sitcom star a nickname instead of just calling him by his last name. Then it’d sound like a serial killer sitcom instead of a family one: Leave it to Cleaver! Next, chop up some garlic, onion, and ginger. 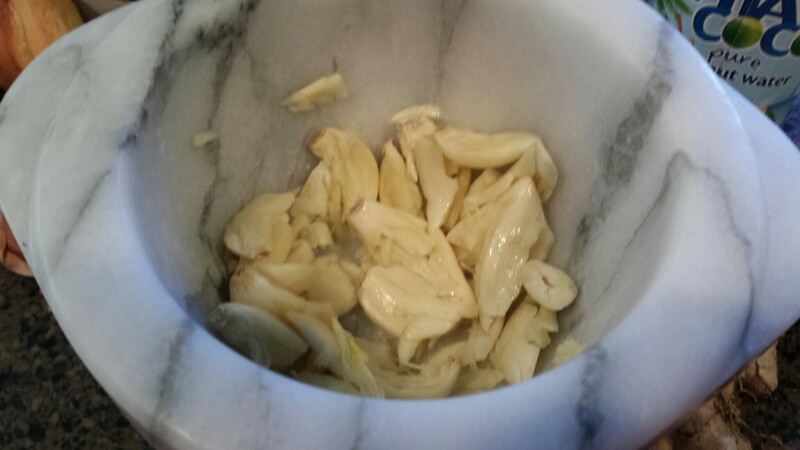 A few thoughts on this: for our wedding someone gave us a mortar and pestle, and it is AWESOME for garlic. I don’t even peel or smash the cloves, I just throw them in and smash them a couple times. The paper falls off and you can pick it out. This isn’t great if you care about uniform sizes, but if you want a ton of garlic quickly smashed into smallish pieces, this is definitely the way to go. If the actress from Young Frankenstein comes up to you and wants to fight, try to walk away. You’ll get Teri Garr-licked in no time. I am a total sucker for those stupid “17 life hacks that will change the way you sit on a couch!! !” articles. 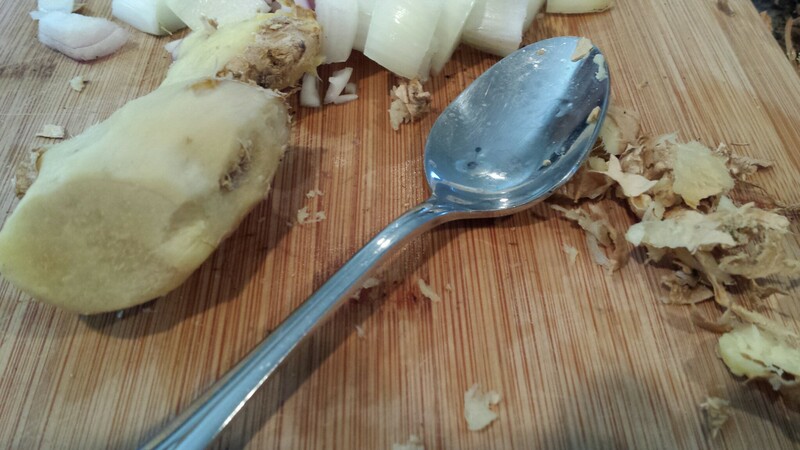 I’ve seen “one weird trick” a few times for peeling ginger: use a spoon. Unfortunately, this one actually works! Especially if you have a fairly smooth/not-too-knobby piece of ginger. Just push the spoon tip in at one end of peel, eating side facing the ginger, and pull down while pushing into the ginger. I can’t believe this worked and now I’ll go nail polish my keys so I don’t mix them up and save my bread bag close-things to label cords. You’ll want diced onion, smashed pieces of garlic, and matchsticks of ginger. Throw that in with your chicken (if you brined it, toss the brine), along with sugar and salt, and let it marinate for at least 15 minutes. 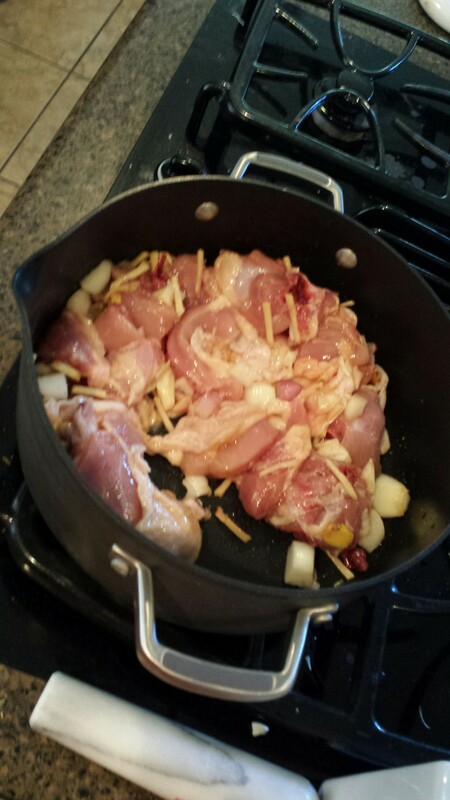 My mom first browns the chicken in a little bit of oil, then adds in the garlic, ginger, onion. I actually marinated it in the pot, and just put the pot on the stove and turned it on. Like I said, super easy. 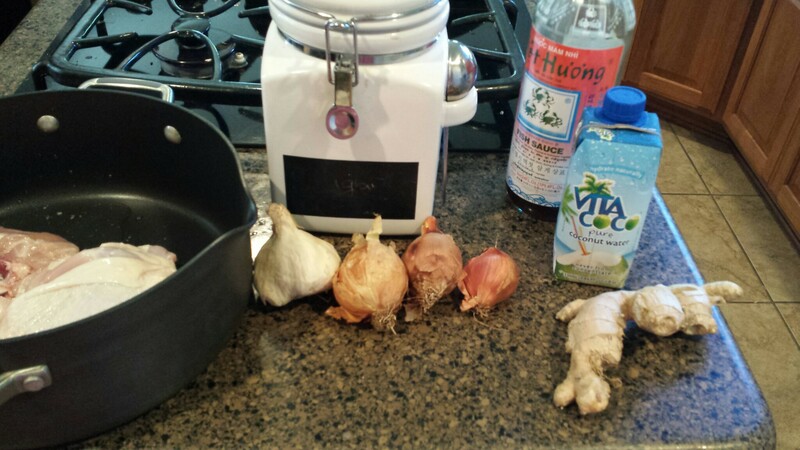 Put it on high, add some fish sauce for flavor, and then your liquid (I used coconut water). Bring it to a boil, then turn it down and simmer for as long as you have. 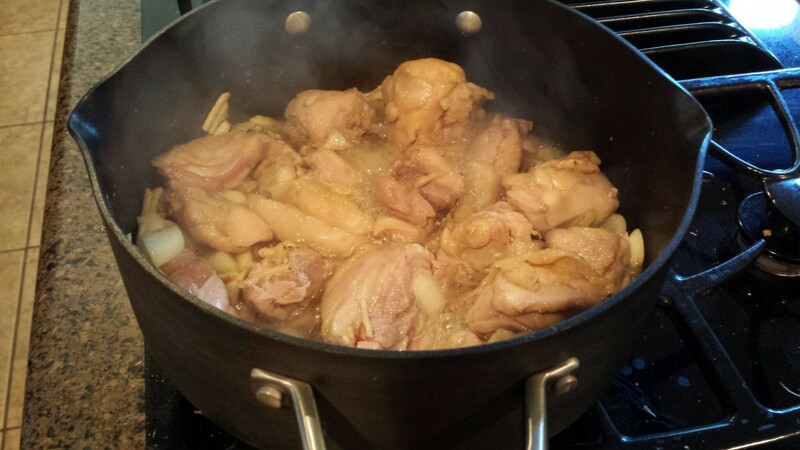 The longer you simmer, the richer the flavor. The chicken will be cooked after about 15 minutes so if you’re in a rush just eat it then. How cute would it be if we called every adult animal like we call chickens? Kittenens? Puppyens? PUPPY YENS?!?! A few minutes before you want to finish it, I like to add some cornstarch to thicken it. 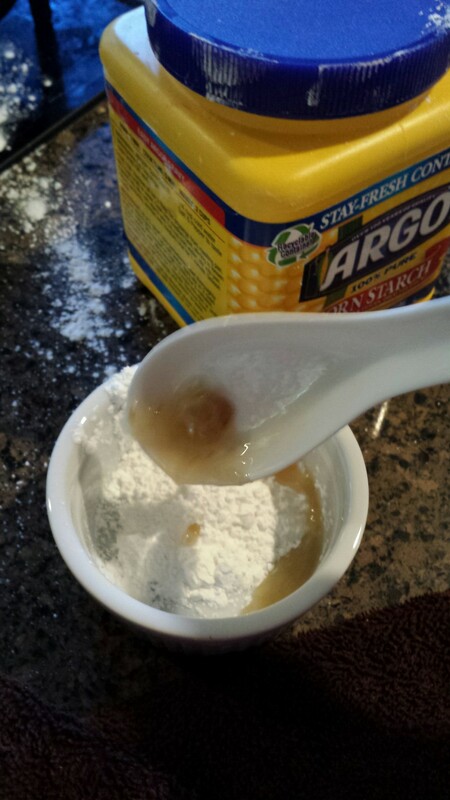 To avoid lumps, put the cornstarch in a small bowl/ramekin and spoon some of the hot liquid into it, then whisk that til smooth. Add the mix to your pot, and stir. Then bring it back to a boil. ‘don, sob’, some’, shiratak’: these are all rame’kin. Serve this with rice and plain boiled vegetables to soak up as much of the sauce as you can. Chop chicken into pieces. If desired, brine in salt water for half an hour. Dice onion, smash garlic, and peel and matchstick ginger. Add to chicken (drain brine, if using) with sugar, and salt and pepper to taste (about 1 TB of salt should be fine, you can always add more fish sauce later). Stir, and marinate for at least 15 minutes and up to overnight. If desired, heat 2 TB of oil over medium-high, and brown chicken pieces, 5 minutes. Then add marinade, and proceed. If you didn’t brown, just cook the whole thing over medium high. Add fish sauce and liquid of choice, bring to a boil, stirring a few times (at least two or three times). Lower heat and simmer at least 15 minutes, or for an hour. Five minutes before you want to eat, place corn starch into a small bowl. Spoon in some of the hot liquid, and whisk until smooth. Add corn starch mix to pot, and incorporate and bring back to a boil. Boil for one minute while stirring, then turn off stove. 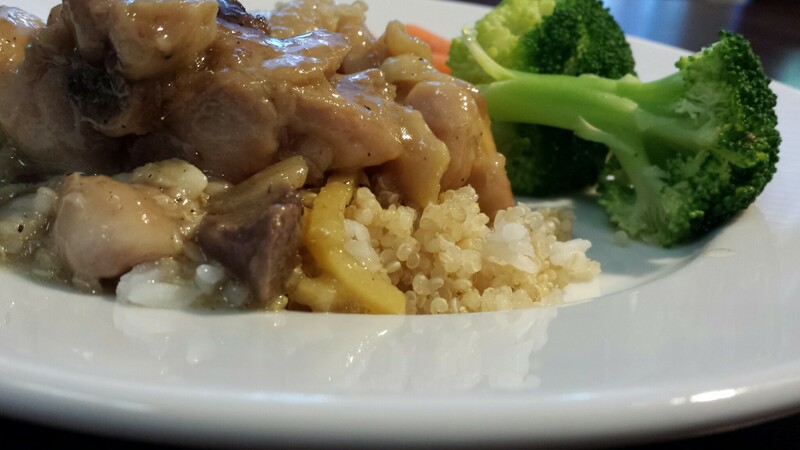 Serve with rice and boiled vegetables.